One of my absolute favourite products in the new mini catalogue is the two-step bird punch. I adore birds and can't imagine being stumped for something lovely to do with this punch! I've made a very simple birthday card with it this time. It's called a two-step punch because first step: you punch out three separate shapes - the bird, its wing and that beautiful branch (how useful will that be!) - and then, second step: you put the shapes together. This striped paper is from the new mini catalogue too; it comes in a 12x12" book of 12 gorgeous double-sided designs, all quite different - that's 48 different papers for £19.50! This paper is great quality and is only 40p a sheet! It's so exciting to be creating with these gorgeous new products. This is a very good time to be hosting a Stampin' Up party! 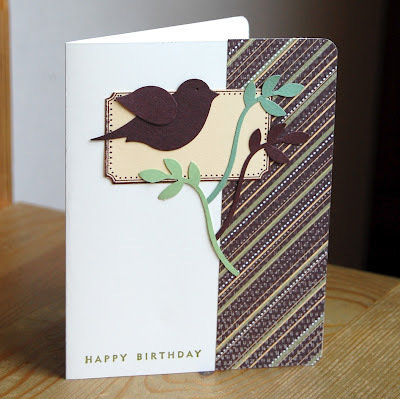 Lovely card, bird gorgeous in the brown, must order this punch!